A brewery in Virginia has recently resurrected a 300-year-old beer recipe brewed from persimmons, bringing a piece of 18th-century America back to life for our drinking pleasure. "With a lot of these recipes, the real fun of it is trying to figure out where the little pieces of wisdom hid in the recipes," Tom Sullivan, one of Ardent’s co-owners, was quoted as saying. The beer itself is said to be a light peach color with a bit of sweetness and tangerine-like notes. It clocks in at just around 3 percent ABV—far lower than most modern brews, but at a level typical of its time period. Back then, beer was often a safer substitute than water, which could be infested with bacteria. 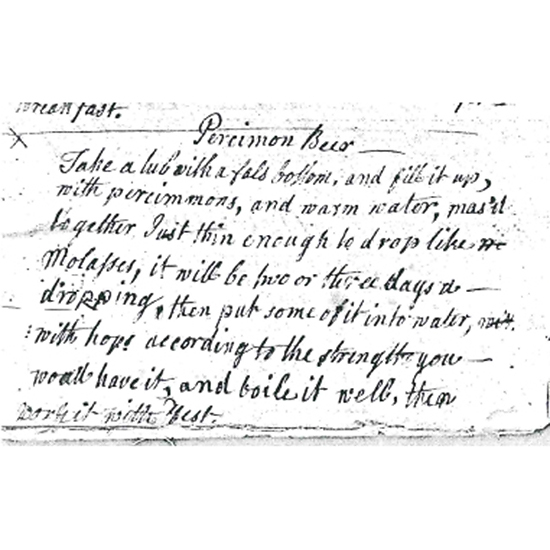 The unique persimmon brew is reportedly just one of thousands of alcoholic recipes in the society’s collection, meaning that even more crazy Colonial Era concoctions could be on the horizon. Both Sullivan and Paul Levengood, the Virginia Historical Society’s president and CEO, were optimistic about the possibilities. Ardent Craft Ales isn’t the first brewery to try their hand at reviving historical brewing recipes. Yards Brewing in Philadelphia has their Ales of the Revolution series, creating beers based off recipes from founding fathers Thomas Jefferson, Benjamin Franklin and George Washington. Delaware’s Dogfish Head Brewery set their sights on even older eras with their Ancient Ales series, working with ingredients reflected in writings from ridiculously old sources such as a 9,000-year-old Chinese tomb and Egyptian hieroglyphics. Back in October, we even covered a beer brewed based on bottles found at the bottom of the ocean in a 150-year-old shipwreck. Jane’s Percimon Beer isn’t even the first persimmon beer brewed in America. Indiana’s Upland Brewing and Bloomington Brewing both make beers that contain persimmon, which makes sense in a state that holds an annual persimmon festival. Turns out America’s renewed interest in unique beers isn’t simply presenting us with awesome new styles—it's also reviving a lot of long-lost brews as well.